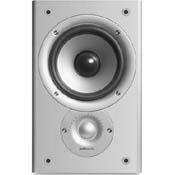 Upgraded some JBL monitors to these, and wow! Great overall performance. Typical bright top end from Polk, but not too much. Dial up the bass to match and great, balanced sound emerges. Great detail and tight low end response, almost didn't need to dial up the subwoofer. Very directional, expected by something that has a moniker of Monitor. With the upgraded crossovers,the base is fast ,tight,and much more prominent.The mids have really smoothed out and things like acoustic guitar,wind instruments, female vocalskeyboards, etc... sound more forward and clear. The highs originally had a constant ssssshhhhh sound with no distinction between cymbals or other instruments. Now,I can actually hear more detail and the tweeters actually add more clarity.I am pleased for a small modest investment. I have to be careful and not turn these up loud because they are so much cleaner sounding as I live in an apt.Kudos to Polk Audio ! Weak base,distorted highs,slightly recessed midrange--as to be expected from a small woofer with the crossovers in stock form.Still,these are very capable speakers for the low price. I simply cannot afford high end anymore.I've never owned Polk .Decided to try out this very affordable speaker.As usual the components are sub par in the crossover network-this applies to any low end speaker okay.These sound alright in the highs and mids but base was lacking including good overall resolution.This to be expected from a 5 1/4" woofer. I decided to replace all the stock capacitors with decent polypropylene caps and POW ! Just what the doctor ordered, NOW WERE TALIKING HERE ! Clear and detailed sound, craftmanship and price. Will take several days or weeks to break-in and tuned this speakers to get the right sound. Lack of bass, but hey...these are bookshelf speakers that's why I have my power sub. Overall, it's worth the price I'd paid for. I bought this Polk M30 three weeks ago. At first I was very disappointed with the sound. Thin, too bright and couldn't get the details that I'm looking for. But after several days of breaking-in and employed the bi-wire capability. The sound of this small speakers became amazing, clear and detailed plus the craftmanship and built...I mean rocksolid for the enclosure. Sound stage, overall response, musicality & they don't take up a lot of space. No super low frequencies, But thats what the sub is for! I listened to a variety of speakers and for price-performance I could not find anything to compare. Hooked to my new HK AVR235 receiver also with CS1 center & PSW 202 subwoofer. This system sounds very good for a really great price!